Hatshepsut who lived 1508-1458 BC was the fifth pharoah of the Eighteeth dynasty of Ancient Egypt. She is famous for sending out a plant hunting expedition to the Land of Punt, thought to be located in Somalia. She sent five ships with 270 men and they returned with many trade goods, and most notably living Myrh trees carried with their roots in baskets. The trees were planted at the mortuary complex at Deir el-Bahari (Hatshepsut’s Temple). This is the oldest known case of plant hunting. 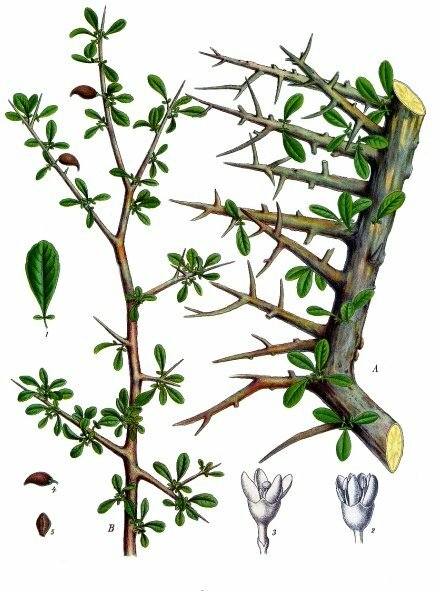 Myrrh is a small thorny tree that produces an aromatic resin. If the bark is wounded, the sap oozes out, hardens and then is collected. Myrrh gum is burned as incense. It is also has medicinal qualities and is used as an antiseptic in mouthwashes and toothpastes. It is used as a pain reliever for toothaches, bruises and sprains. 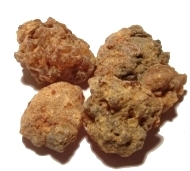 Myrrh has also shown to inhibit certain forms of cancer. Myrrh gum is used as an oil and incense in many religious ceremonies. The ancient Egyptians mixed it with the salt natron to embalm mummies. Myrrh and frankincense were prized trade goods. In the ancient world Myrrh was worth its weight in gold. According to the Bible the three Magi brought gifts of frankincense and myrrh to the infant Jesus.